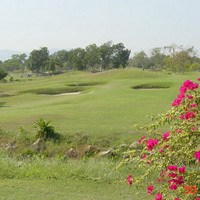 Dotted with characteristic pot bunkers and areas of ’native’ lemon grass which require particular skills to escape from first time, there is also many strategically placed sand traps, but not a lot of water hazards. The 3 nine holes present a challenging layout requiring ingenuity, careful club selection and precision driving. Lots of fairway undulations gives a links feel to this hilly parkland setting. Each shot must be carefully anticipated as numerous pot bunkers await any errant shots. The full service clubhouse overlooks courses A and B. After your round, you can enjoy have a cold beer on the large balcony and watch the sun set over the rolling Chonburi hills. If the weather is a little cloudy, you can feel like you are on a links course in Scotland or England.